Mastitis is the inflammation of breast tissue. In this case use the Acupoints of the upper back. 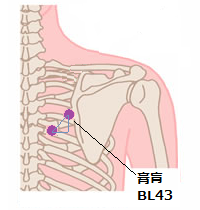 BL43 (膏肓) : by the inner side of a shoulder blade, around middle, if it presses down, a place with an oppressive pain will be taken. Also, take the point at the place where the length of the thumb under BL43 then the length of the thumb inside.